Over the course of human history, the wolf has been regarded as one of the most powerful spirit guides, a symbol of strength, intuition and intelligence. 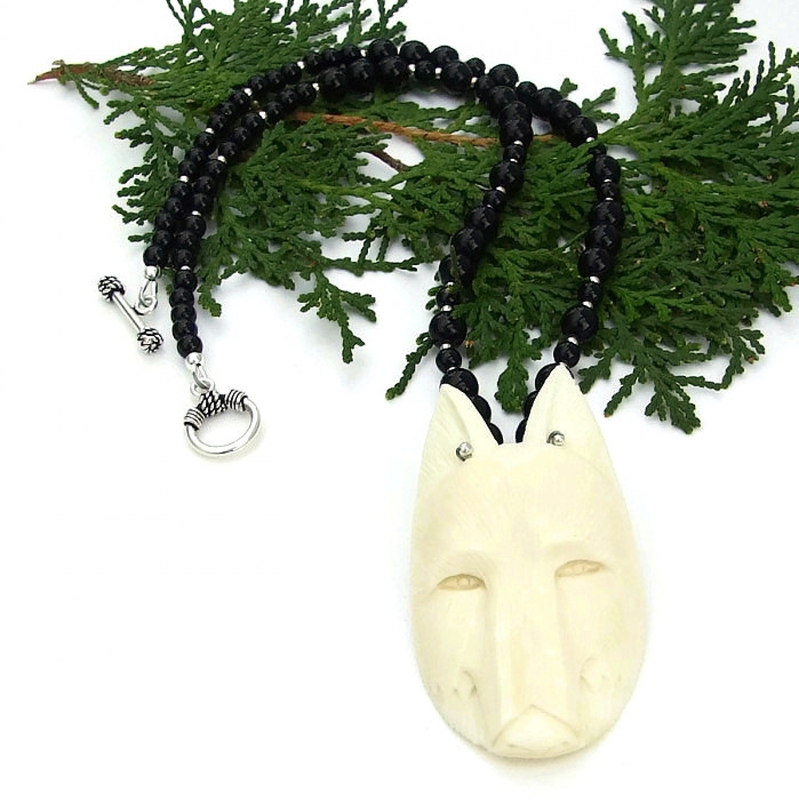 If you are enchanted with the majestic, wild quality of wolves and adore unique handmade jewelry, you will definitely love the LOBO necklace. 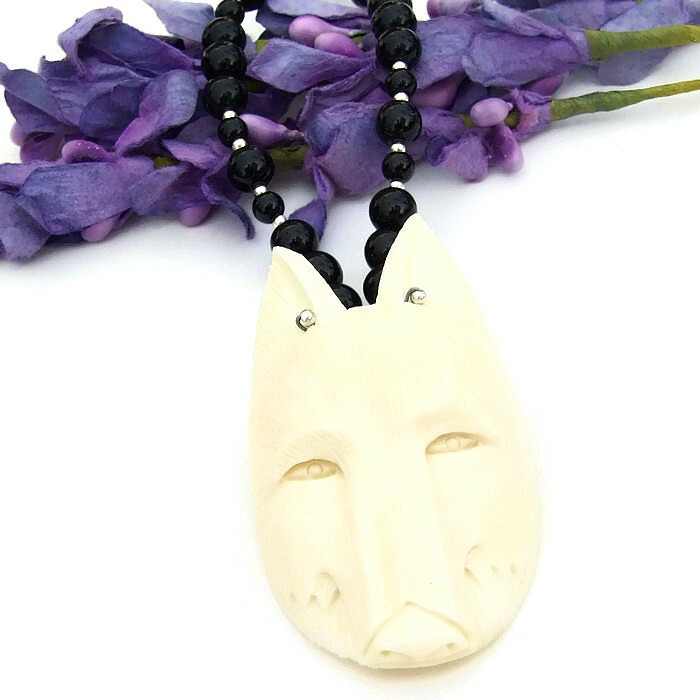 The focal of the one of a kind necklace is an eye catching wolf head totem pendant that was hand carved from bone, polished so it glows. Two sizes of black onyx gemstones sprinkled with small sterling silver beads make up the main body of the necklace. A patterned sterling silver toggle clasp finishes the necklace beautifully. 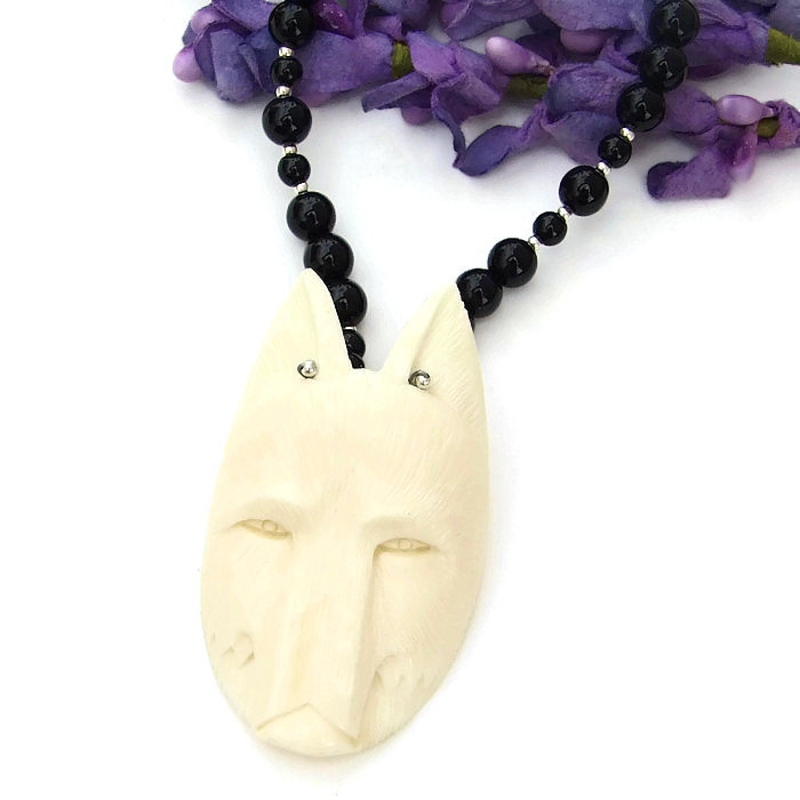 Created for the woman who is not afraid to show her “wild” side in jewelry designs, the LOBO necklace was carefully designed and handmade by Catherine of Shadow Dog Designs. 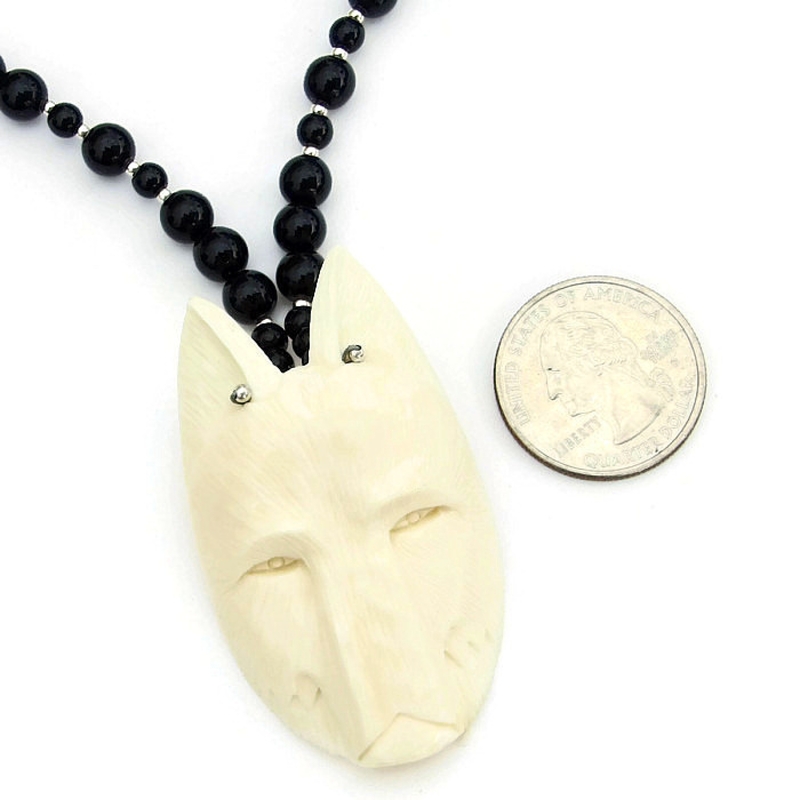 *** For a better understanding of the relative size of the wolf totem pendant and black onyx used to create the LOBO handmade necklace, please be sure to check out photo # 6 for a size comparison with a quarter. Picked out from a bowl that held five other wolf head pendants - each one was similar but also different - this particular totem had more of the “wolf spirit” than the others. 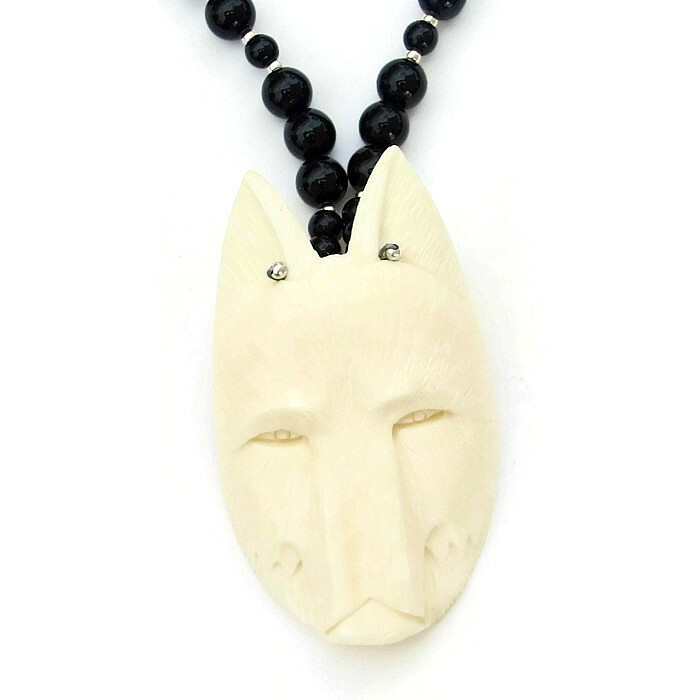 The artisan hand carved wolf head pendant has incredible totemic detailing: the ears, eyes and nose are all intricately carved, and you can see individual hairs throughout the face. The color of the bone is a lovely ivory and has been polished to a rich glow. The pendant is not flat, the sides curve towards the smooth back. 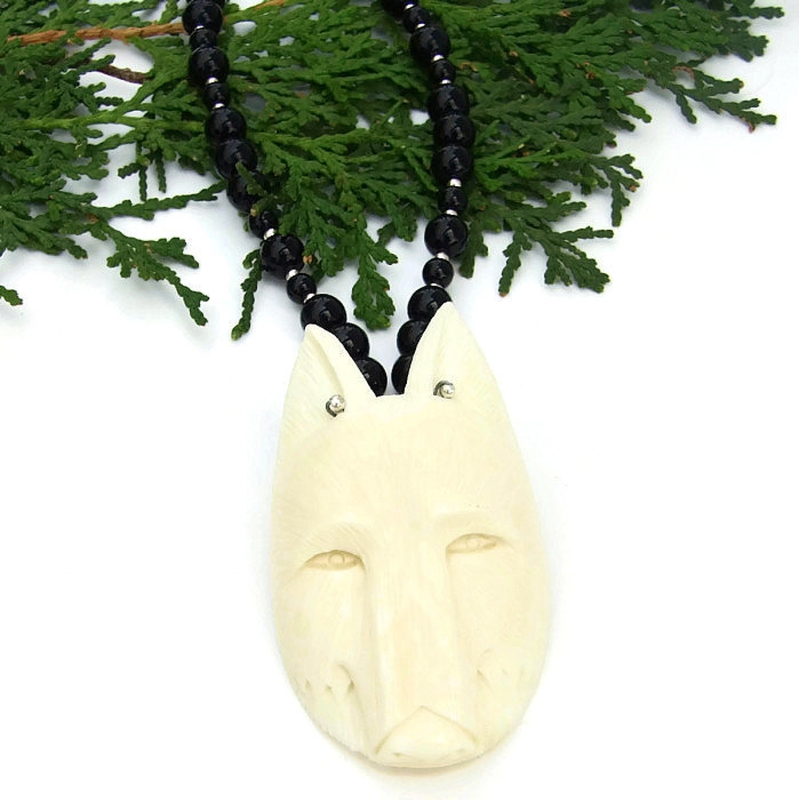 The main body of the necklace is connected to the unique pendant through a hole drilled into each of the wolf’s ears. 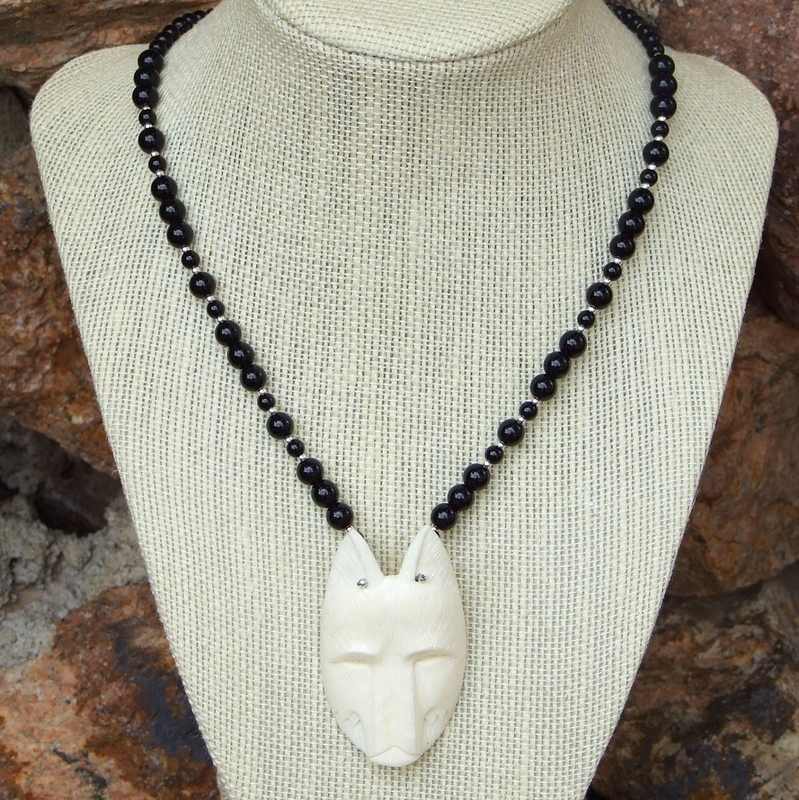 Black onyx gemstone rounds were chosen to enhance the beauty of the wolf head totem used in the LOBO necklace. The larger black onyx rounds were put in four groups of three, each group separated by sterling silver beads, two smaller black onyx rounds and one larger. The back of the necklace was finished with groups of the smaller rounds, each separated by sterling silver. To complete the one of a kind LOBO necklace, a lovely patterned sterling silver toggle clasps et was used. Throughout the course of human history, the wolf has been regarded by many cultures as one of the most powerful spirit guides, a symbol of strength, intuition and intelligence. Bone is said to bring good fortune and strength. Black Onyx is believed to be a powerful protective stone and is used as a defense against negative thinking; it is said to bring balance to mind and body and helps the wearer approach a task with greater self confidence. Silver is a metal of love and healing; it is believed to be a mirror to the soul, helping us to see ourselves as others see us. 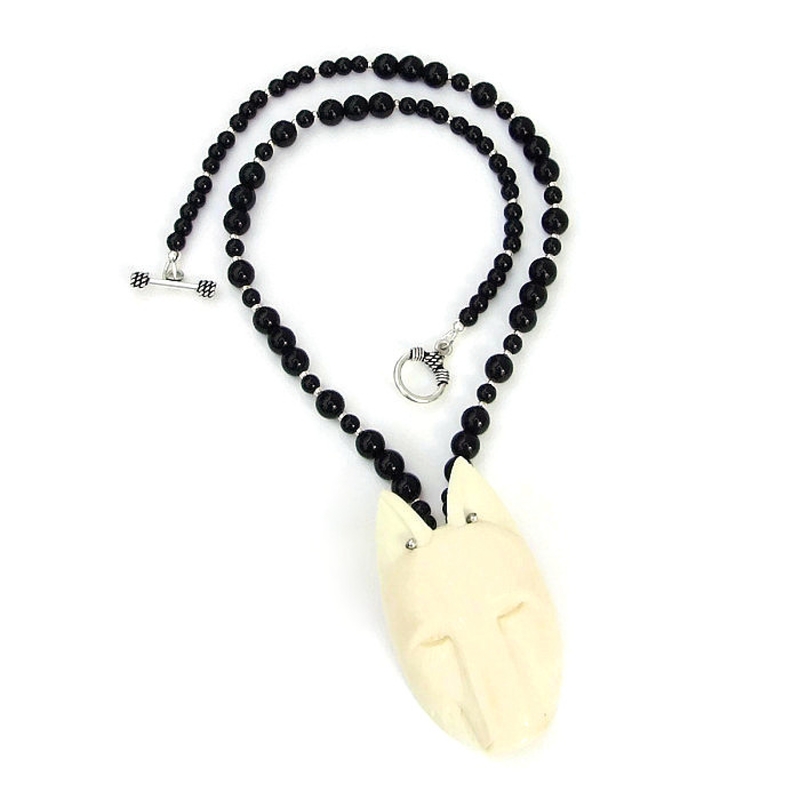 The LOBO artisan necklace was carefully designed and handmade in a dog friendly, smoke free studio. The necklace will come with two informational drop tags: one with the piece's name; the other lists the materials used in the necklace and the language of the stones and metals. It will be carefully packed in an organza jewelry bag, perfect for gift giving to a loved one . . . or to yourself!